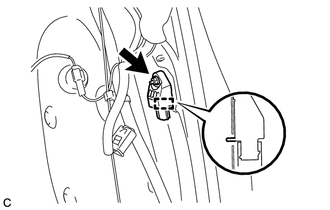 (c) Disconnect the connector from the rear airbag sensor. (1) Push and hold the white housing lock, and slide the yellow outer connector locking sleeve. (2) Push and hold the white housing lock again, and slide the yellow outer connector locking sleeve to disconnect the connector. (d) Remove the nut and rear airbag sensor. Loosen the nut while holding the rear airbag sensor because the rear airbag sensor pin (stopper) is easily damaged.